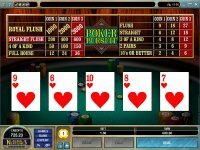 Video poker offers some of the best odds of any casino game, and many players love it precisely for that reason. The games are easy to play, and with a little study, anyone can master perfect betting strategy. The true randomness of the games and strict adherence to payouts means a royal flush can happen at any moment - sometimes even several in one session. 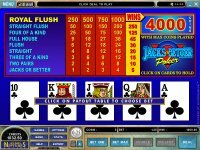 Video poker is a natural fit for online casino gaming, as your computer (or mobile) screen is very similar to what you find at a land casino. 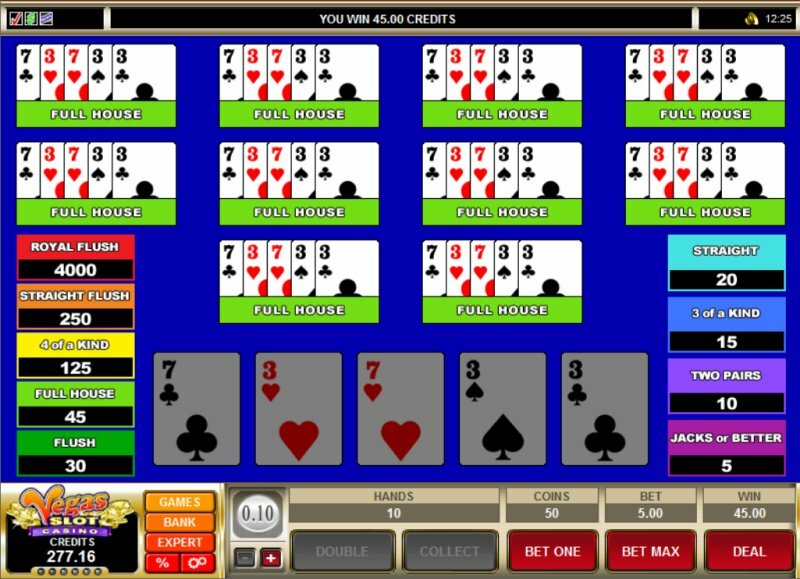 The selection of video poker games at online casinos is also very impressive with all kinds of variations and multi-hand choices available. There are even a handful of progressive games. 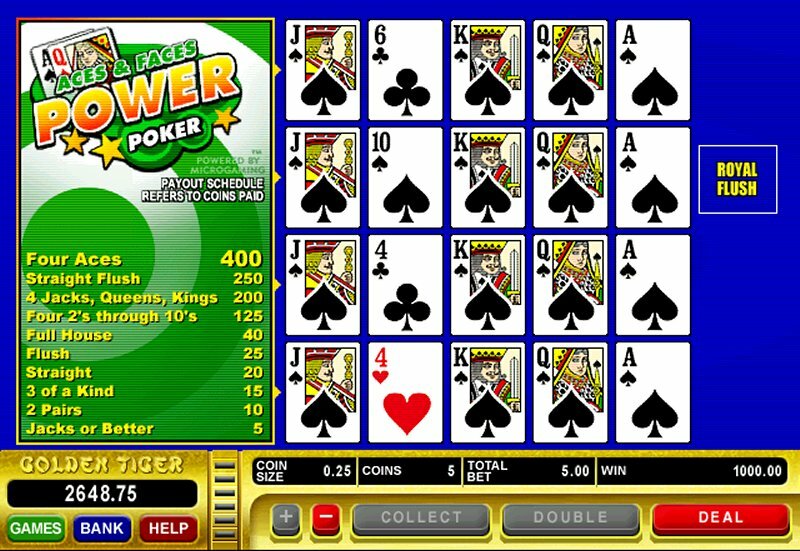 Power Poker is a fun game of video poker because it lets you hold cards on the first hand, and then you can win up to four times based on what comes up on the draw. In this instance, it worked out great, as I was dealt four to a royal (J-Q-K-A), and hand number two ended up giving me the ten of spades I needed. This was my first royal flush playing online, way back around 2002. I was betting 5 coins per game (1.25), and the royal paid out 1,000 credits (the top win on the pay table is absent, as it was blinking when I took the screen capture). 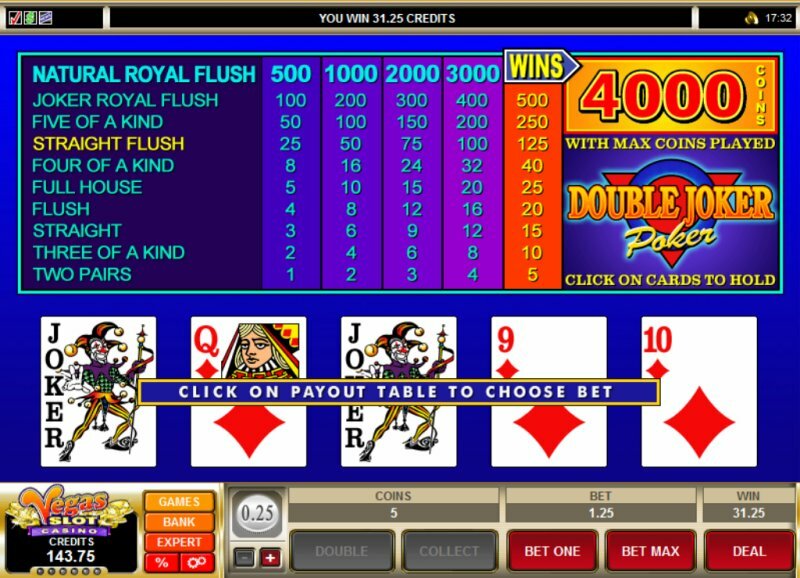 With two jokers in play in this game of video poker, royal flushes and any matches appear more often. The payout table adjusts for this accordingly. In this win, I was holding both jokers, the queen and ten of diamonds, hoping for a royal flush. The draw card ended up being the 9 of diamonds for a straight flush. Betting 1.25 credits per hand resulted in a payout of 125 coins (31.25 credits). 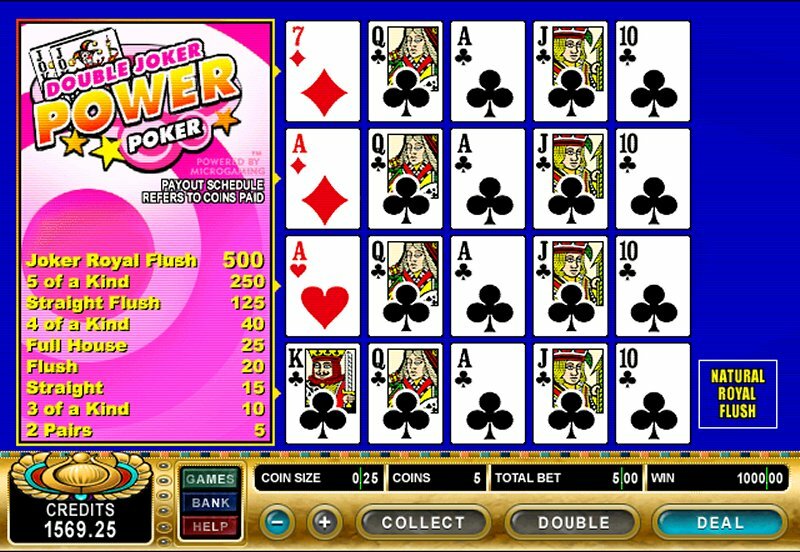 This is another of the many variations of Power Poker (four-hand video poker). I was dealt four to a royal (10-J-Q-A), and just needed the king of clubs for the win. Hand number four provided the king for a natural royal flush, which at 5 credits per game paid out 1,000 credits. 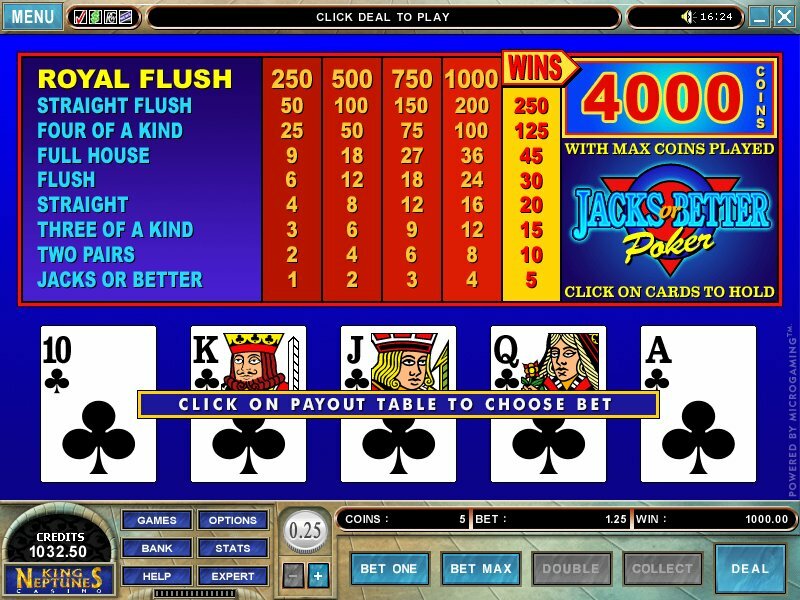 Here is another royal flush win, this time playing standard Jacks Or Better video poker. I like jacks or better because the payouts are decent and the betting strategy is fairly easy to master. This royal took quite a while to get. I'd been playing for a good five hours, and I was down about 250 credits at the time. With just 33.75 credits remaining in my bankroll, I scored the queen of clubs I needed and a quick 1,000 credits. Ten play power poker is just like four hand, but with six more hands in play. The best thing about this game is landing a pat hand, so you are guaranteed to win at least something on all ten hands. In this case, I started with two pairs (fives and tens), and was hoping to land some additional fives and tens for full houses. Unfortunately, I only managed one full house, which is about even with expectations, given that each hand comes from a different 52 card deck (4 in 48 chance : 1 in 12 per hand). My 5 credit wager ended up returning 13.50 credits. A different day, a different session, a different casino... same game. This time, I was dealt a pat full house. You can set the options to auto-hold a winning hand, if you like, or turn off auto-hold if it interferes with your betting strategy. Being dealt a full house resulted in an automatic 10 play full house win. 5 credits were bet, and 45 credits won. 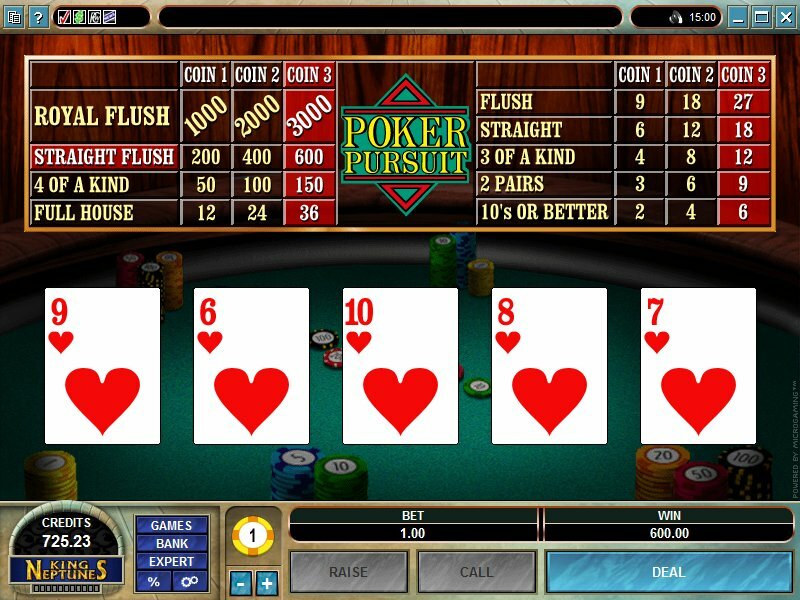 Not exactly a traditional video poker game, Poker Pursuit more closely resembles the casino table game Let It Ride, but it involves holding cards and poker hands so we're featuring it here. 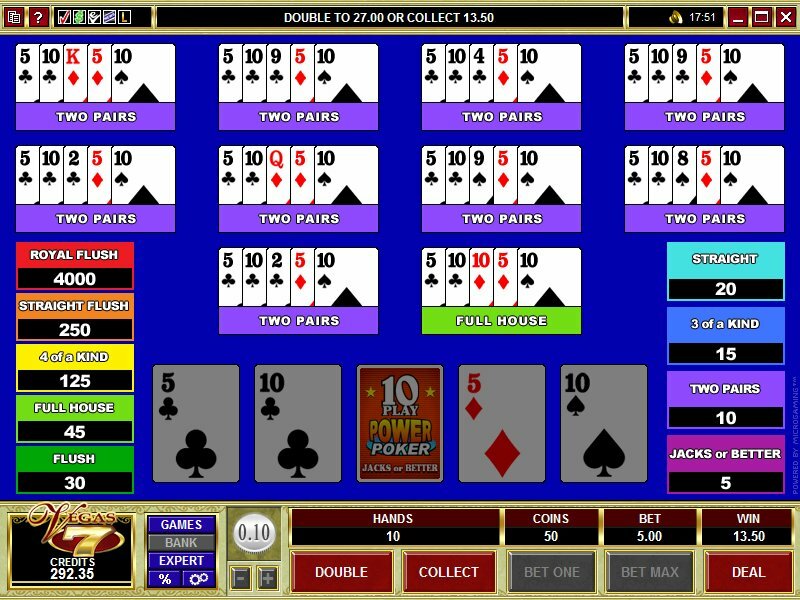 A player starts with three up cards and two hole cards, then decides to raise or call each time as the two hole cards are revealed. Raising with three non-sequential cards to a flush goes against strategy, but it happened to be St. Patrick's Day, and I was feeling lucky. I raised each time as the 8 and 7 of hearts were revealed for a straight flush, and my initial 1 credit wager (raised twice to 3 credits) scored a payout of 600 credits. 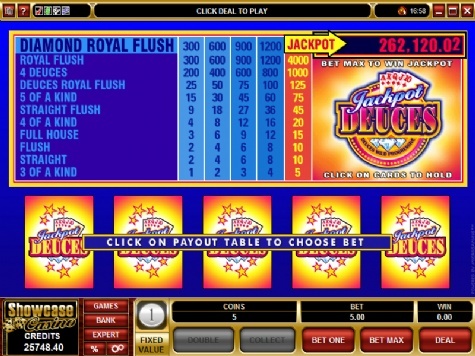 Play thrilling video poker games at one of the internet's leading casino sites. for players and learn the chances of every hand in video poker.